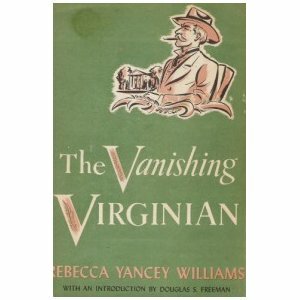 I've wanted to see THE VANISHING VIRGINIAN for years, since I first read a thumbnail sketch of it in THE MGM STORY by John Douglas Eames. I've been even more anxious to see it as I've become interested in the career of director Frank Borzage. Needless to say, I was very excited when I learned the film would be released on DVD-R via the Warner Archive, and I immediately bought it in the Archive's Independence Day sale. 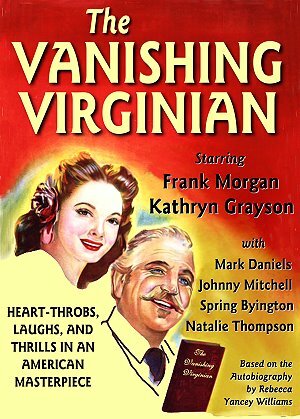 THE VANISHING VIRGINIAN is based on a memoir by Rebecca Yancey Williams, portrayed in the film by a very young and quite adorable Kathryn Grayson, in her second film. She was 19 when she played Rebecca, the daughter of "Cap'n" Robert Yancey (Frank Morgan), the District Attorney of Lynchburg, Virginia. The film is set in 1914, and it's a simple tale of the life of the Yancey family against the backdrop of the changing world, including the advent of motorcars, the suffragette movement, war in the Balkans, and Prohibition. The film is basically a series of vignettes, occasionally punctuated with music, reminiscent of the style of the later MEET ME IN ST. LOUIS (1944). 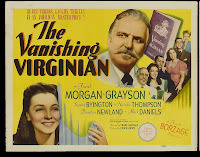 Anyone who loves MGM-style Americana, including not only MEET ME IN ST. LOUIS but films such as THE HUMAN COMEDY (1943), OUR VINES HAVE TENDER GRAPES (1945), SUMMER HOLIDAY (1948), or TWO WEEKS WITH LOVE (1950), is sure to like THE VANISHING VIRGINIAN. The warm portrayal of the marriage of "Mr. Yancey" (as his wife always addresses him) and his absent-minded bookworm wife Rosa (Spring Byington) is quite delightful. It's told with great tenderness, and Byington as Rosa simply glows. There's also some delightful humor, such as a joke about the odd location of the dining room, which has a nice payoff in the final scenes. 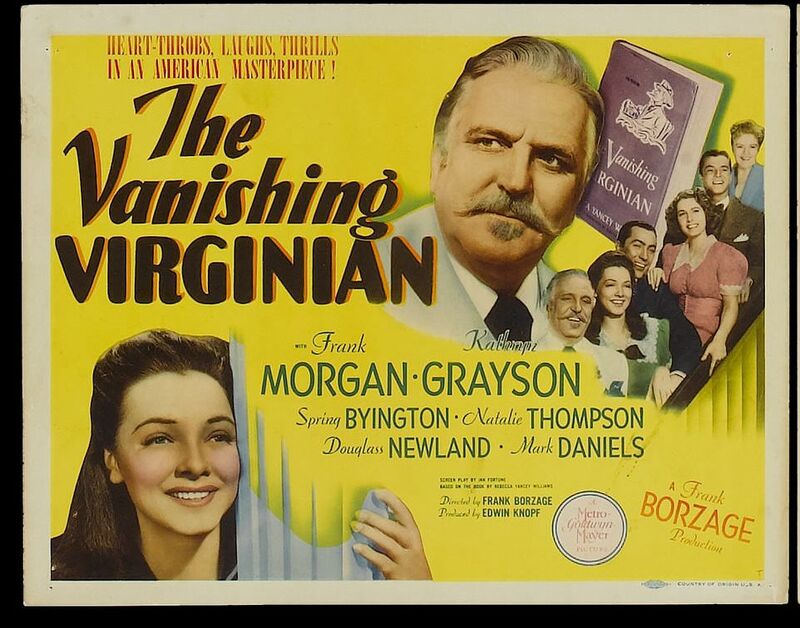 This film must surely be among the finest performances of both Morgan and Byington. In addition to Rebecca, the Yanceys' other children are Margaret (Natalie Thompson), who scandalizes her mother by desiring to be -- gasp! -- a lawyer; Robert Jr. (Dickie Jones); Caroline (Juanita Quigley); and Joel (Scotty Beckett). Grandma Yancey is played by Elizabeth Patterson. Grayson's portrayal of Rebecca, who is on the verge of womanhood and wants to put up her hair and let down her skirts, is charming. Becky may want to grow up, yet she isn't above shocking the family by painting the roof wearing her brother's pants, or brawling with one of her brothers over said pants. Grayson's only previous film was ANDY HARDY'S PRIVATE SECRETARY (1941), yet she's completely at home in front of the camera, giving a sweet, unaffected performance. Grayson's singing is worked into the film in a very natural way, and the musical moments are some of the best scenes in the movie. One of the scenes, with the family singing on the porch after the parents have had a disagreement over the father's career, is extremely reminiscent of the "You and I" scene in MEET ME IN ST. LOUIS. The sequence where Becky sings a spiritual at the funeral of her father's lifelong best friend, the family servant "Uncle" Josh (Leigh Whipper), moved me to tears. It's currently available on YouTube, but be forewarned that what precedes the song gives away a little more of the plot than I have shared here. There are a number of nice photos from the film at the official Kathryn Grayson website. I especially loved her sailor suit! I particularly enjoyed Juanita Quigley as young Caroline. The way she carries a cat around again made me think of MEET ME IN ST. LOUIS, and Agnes (Joan Carroll) and her cat. Watch closely for a scene where the cat is on Cap'n Yancey's shoe; you can spot a thin piece of string tethered to the cat, apparently to make it walk off camera on cue. In a nice touch, Juanita Quigley's older sister, Rita Quigley, portrays Caroline in a brief postscript set in 1929. 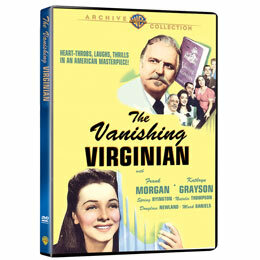 There's also a nice tie-in between THE VANISHING VIRGINIAN and SUMMER HOLIDAY, a film in which Morgan costarred. Margaret's beau sells Stanley Steamers, which were a major plot point in SUMMER HOLIDAY, and even the subject of the Warren-Blane tune "The Stanley Steamer." The supporting cast includes Louise Beavers as the family cook, J.M. Kerrigan as Yancey's longtime campaign manager, Douglass Newland (later known as both Douglass Drake and Johnny Mitchell) and Mark Daniels as the men who are interested in Margaret and Rebecca, and Katharine Alexander as a suffragette who was once Yancey's flame. The film runs 97 minutes. It was filmed in black and white by Charles Lawton Jr. The Warner Archive DVD-R print is, for the most part, excellent. There are two scenes which are notably "speckled" and would have greatly benefited from remastering, but the majority of the film is in very nice shape. There are no extras. Enjoyed reading your review on this film. This is one I've always been interested in seeing, primarily because of Frank Morgan. It was a nice surprise to see it released through the Warner Archive. It was a real treat, Robby. I hope you enjoy it when you catch up with it.